Now that you have decided on your formula, picked the right tube for your product and are ready to get it to market, it is essential that your artwork showcase your product to its best advantage. And, that means using color to convey your branding and product messaging effectively, efficiently and effortlessly. There are four key elements that create the perfect tube package. Every product has a color, and you need to decide if hiding or showing your product adds to its sellability. Hide your product if it will separate, settle, is sensitive to light, or needs to be shaken before use. This means using a solid color tube. 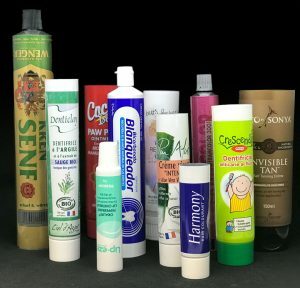 Show your product if it has a vibrant color, smooth consistency, or another selling feature you want to highlight – in other words a clear tube is for you! Once you know your product color, you can pick the appropriate tube that will HIDE, SHOW, or KIND OF SHOW/HIDE your product. HIDE your product by using black or white (or other opaque-colored) tubes. SHOW your product by using a clear container. Pick the tip that best suits your product – standard, specialty, pump, spray, etc. and then choose a color for the closure that coordinates with your product and tube. Using a unique tip can elevate the look and usability of a simple tube. This is the last thing to pick. the colors you choose should project the brand image you want to project. As a general rule, the more color added to a design, the less “sophisticated” that product is perceived as. You will want to pick colors that communicate what your product is about. Color is the first clue as to what your product does so be sure your tube tells the right story for your product and brand. White conveys innocence, safety, purity and simplicity. White is a great color to use as a canvas for the rest of your design and gives a sophisticated backdrop so be sure not to underestimate the power of a white tube. The message the color black sends changes depending on how it us used in the overall design and what other colors it is combined with. For example, combine a black tube with pink writing to give the product a more feminine look, complement it with white a more sophisticated look, or add gold to add the illusion of added value to the product. With blue, brightness is key. A professional dark blue can send a completely different message than a playful sky blue. . While blue is the most liked color worldwide by both males and females, shades of blue offer very different results. Younger demographics seem to prefer bight electric or neon blues, while an older audience demonstrates a preference towards flat blue colors that have a calmer feel. Red is a great attention grabber and is often associated with passion and excitement. Much like blue, red needs to be used carefully. The darker a red is, the more perceived value the product will have. Red can make your tube stand out on a crowded store shelf. A color that is especially useful at a time when ecologically friendly packaging is one of the top concerns for consumers, green connotes nature, cleanliness and sustainability. For food and beverage products, green tubes and artwork suggests that the product is healthy, organic, or was made using environmentally-friendly practices. Green is also a pretty universal sign for “correct” as opposed to the red “wrong” connotation. It’s the happy color! But use it sparingly as having excessive amounts of yellow can actually make people uncomfortable as the brightness of the color overpowers other elements of the design. When using yellow, keep in mind it is one of the only colors that almost always looks best in purest form. Shades of yellow can come across as sickly or gross, feelings you don’t want consumers correlating with your tube. Often a sign of creativity, orange is a youthful color that makes consumers think of citrus and sunshine. Orange is a curious color, not quite as aggressive as red, but less cheerful than yellow. Overall, choosing the right tube color and complimentary artwork is a process that needs to be given careful consideration. The better your design, the more consumers will respond to your brand on a store shelf.